Witches, goblins, and elves are not what makes Halloween exciting. For me, it’s the pumpkin harvest. For about six years now I’ve been trying to grow a pumpkin in my backyard. I’ve tried fertilizers, all types of seeds, and different soils but nothing ever seems to work. The furthest I’ve ever gotten is a vibrant yellow flower that eventually shrivels and dies. It’s upsetting when you put so much work into something and then it fails, but year after I year I keep on trying to grow a pumpkin. That’s why when I see pumpkin growing competitions around Halloween I stare in awe at the television, wondering how the farmer grew such a heavy, beautiful pumpkin. What I find even more fascinating is how carvers can take these orange wonders and create three dimensional sculptures from them. So long jack-o-lanterns, meet puss in boots with life-like whiskers. Pumpkins are just so interesting. Not only can you grow them until they weigh hundreds of pounds, not only can you sculpt them, but you can also use them to make fabulous pies and tarts. In fact, you can hollow out small pumpkins and use them as bowls for soup during a dinner party! That’s why when I used to go trick-or-treating I didn’t go for the candy, I went to go see the beautiful pumpkins; they were simply works of art in my neighbourhood. This churro recipe is much better than a lot of the recipes that I’ve tried in the past because it has eggs in it. Without the eggs the inside of the churro is not soft and delicate, but crunchy. Trust me. 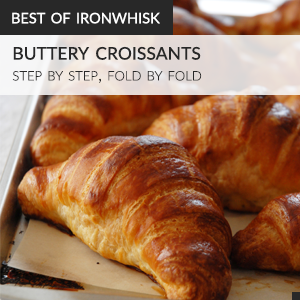 You’ll love this recipe. A recipe for "Spanish donuts" or churros with a cinnamon-sugar coating. These are made with eggs, like real choux pastry should be. In a bowl sift together the flour, sugar and salt. Set aside. Place the butter and water in a heavy saucepan over medium heat and bring to a boil. Remove from heat and, with a wooden spoon or spatula, quickly add the flour mixture. Return to heat and stir constantly until the dough comes away from the sides of the pan and forms a thick smooth ball. Transfer the dough to your electric mixer, or with a hand mixer, and beat on low speed a minute or two to release the steam from the dough. Once the dough is lukewarm start adding the lightly beaten eggs and continue to mix until you have a smooth thick paste. Using a piping bag with a star tip, pipe the smooth dough into hot oil. 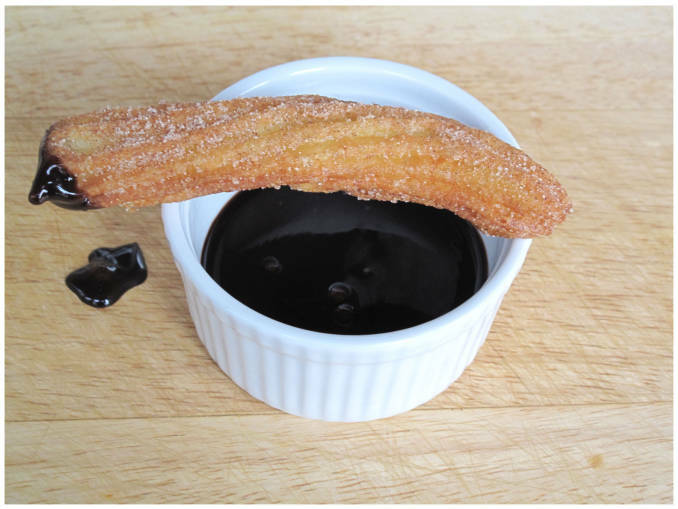 Make sure the oil is hot or the churros will be hard instead of crispy. Fry until golden brown, about a minute per side. Mix the sugar and cinnamon in a bowl. 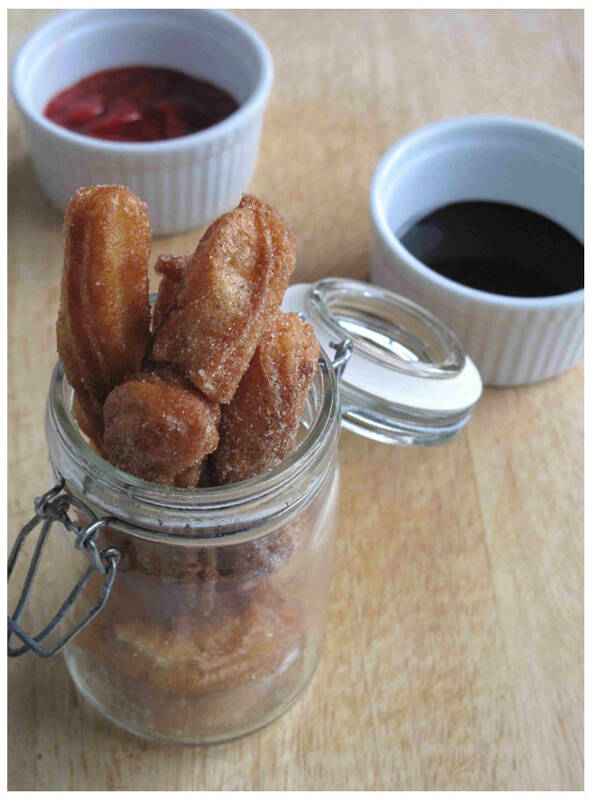 Drain the churros on paper towels then place in the bowl and mix until the cinnamon-sugar coats the churros. Serve hot alone or with chocolate, strawberry, or caramel sauce for dipping. i’ve been looking for a good churro recipe! these look like a good one to bookmark. thanks.